I was hospitalized in 1993, 2000, and 2003. Each time was because of manic episodes. Since my first visit I have had many labels, schizophrenic, bi-polar – sometimes it was bi-polar I, sometimes bi-polar II. There have been other labels as well, but I’ve never paid attention to them. The label has always depended on who I saw, when I saw them, what was going on in my life, and where I was in my mood cycle. I knew since my first visit to the hospital something was wrong. When you think the CBS logo is the eye of god and everything on that channel has a special message just for you, it’s hard to deny there’s a problem. I never cared what it was called. I only cared about how it affected my life and what I could do about it. I always explain my experience of bi-polar as being like that game Cliff Hanger on The Price is Right. When the price guessed is too low and the mountain climber can barely finish the note he’s yodeling – every step is a huge effort – that’s depression. Stability would be when you guess the correct price. Hypo-mania would be when the price guessed is too high and I’m racing up the mountain. Then comes full-blown mania when I am floating around in outer space with my delusions and hallucinations. Eventually I quit floating around in my special version of reality and crash into depression. I never bother going back down the mountain the way I came – I just jump off and crash. Then I lay there and vegetate in my coma. My mom died young and I’m a single mother. Because of this I never once considered suicide. I know I’m fortunate to have my son – he gives my life a sense of purpose. So, eventually I crawl to the bottom of the mountain and try again. Before I found out about WRAP this seemed like a never-ending cycle that I had little or no control over. I didn’t even get to guess the price. I was told that medication would control things. It didn’t – often it just added to my problems. When I complained about the problems I was told I was “in denial” or I “just liked being manic“. I knew this wasn’t true. I felt frustrated and misunderstood. I didn’t think my doctors were listening to me so I didn’t want to listen to them. So they gave me a new label – non-compliant. I knew I was in trouble. I knew I needed help. I knew my doctors were nice people with good intentions, but I wasn’t getting the help I needed. Shortly before my third visit to the hospital I started to read everything I could find that was written by people who actually had bi-polar. At the time I had a really good therapist, who unfortunately moved away a month after I got out of the hospital. I really liked her because she gave me homework and suggested books for me to read. When I first began to see her I was in a deep depression. She had me make a list of things that I used to enjoy doing. Then she encouraged me to try to start doing things on that list. I did what she suggested and I started to come out of my depression. So she got me to start crawling out of my depression, then I started walking, until once again I was running and racing up the mountain. This is when my therapist said to me “I’m probably going to regret this, but you should read this book called The Depression Workbook – it was written by a woman who has bi-polar disorder. She sent out questionnaires to other people who have bi-polar and used that information to write this book.” This is when I was introduced to Mary Ellen Copeland’s work for the first time. When I read this book it made sense to me. I could feel in my gut it was true because the things in the book matched my personal experiences. The first thing that struck me was learning that if you recognized you were in trouble and took action quickly, then your symptoms would not be as severe. I don’t know what this says about my friends and family, but nobody noticed I was in trouble the first time. I was in severe psychosis for a full month before someone finally brought me to the hospital. The person who called 911 was someone I barely knew. The next time I went to the hospital after only 1 week of being in trouble. The difference between my state of mind the first time I entered the hospital when compared to the 2nd and 3rd time is extreme. The month before my first visit I didn’t sleep or eat for a month. I lost 40 pounds that month, which was nice, but it’s not a diet I recommend. I had hallucinations and delusions all 3 times that I was hospitalized, but the first time was much more severe and lasted a lot longer than the other two. The other thing that I knew was effective was creating and using a wellness toolbox. That isn’t what my therapist called it when she had me make my list, but I recognized it when I read about it and knew that it worked. During my frantic, manic reading spree another book I read was a biography about Vincent Van Gogh. During his life he discovered that certain people and places were “triggers” and when he avoided them he didn’t have as many problems with his mental health. This only reinforced what I had learned about WRAP. I was already in the “things were breaking down” stage when I was introduced to this book. A few months later my aunt died. I managed to maintain my instability for two more months before I entered the “crisis” stage and was hospitalized. I’ll avoid telling war stories and skip ahead to the part where I regained control of my life and started working my WRAP. The first and most difficult step I took was looking at my commitments and admitting to myself that I was trying to do too much. What was even harder was admitting that at that moment everything was too much. I finally realized that when I overextend and over-commit myself I get into trouble. This was a brand new concept for me. Before this I always thought that if I had a problem I had to do something about it. It never occurred to me that the solution was to do nothing, not something. I was tired of tackling the same old mountain and if I wanted things to change I needed to give it a rest. Things had reached the point where I had to take a time out from my life and use that time to educate myself about me. So for the last two years that is what I have been doing. Last spring I was struggling with depression so I tried one of the suggestions in the book and started my very first garden. I’m still surprised at how much better it made me feel. My son made fun of me because I would make everyone who stopped by rub the leaves of my lavender and mint plants and smell their fingers. I took time to “smell the lavender” several times a day. Another suggestion I took was to do something special for myself on days that were typically hard. I started buying myself flowers on the anniversary of the days my mom and aunt died. I also do this on their birthdays. Having flowers in the house just seems to make me feel better. The most effective skill that I have been learning (and hope to keep improving) is just recognizing the “early warning signs” as they come up. I monitor my moods closely and adjust my activity and commitments accordingly. If I am overwhelmed and becoming over stimulated, I have learned to take the steps necessary to slow down or stop. When that means I need to stay home and avoid people and places, I do. When I’m under-whelmed and under-stimulated I try to do more. I went back to college last fall, but I only go part-time and I won’t take Spring/Summer classes because they are more intense. My little mountain man still speeds up and slows down. I still don’t get to pick the price and it’s not always right. But that’s ok, because life isn’t supposed to be predictable and that’s what makes it interesting. What WRAP has done for me is give me a leash for my mountain man. When he is crawling I pull him along. When he starts racing up the mountain I reign him in. The last time I flew off the mountain WRAP was the rope I hung onto. The part that makes me sad is that the mental health system that I have available in my community did more to get in the way of wellness than it did to help me reach stability and maintain it. I would like to be able to trust the hospital that is supposed to help me. 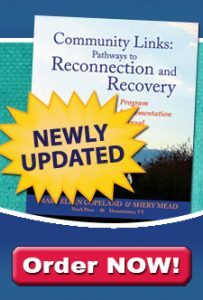 I became a recovery facilitator in February 2006 and I sincerely hope things will change. If it does not it won’t be for lack of effort on my part.